Years ago, I wrote "atheist" on Twitter, and one cautioned me about using that word because I risked "calling down the thunder". We know that they can be ornery cusses even on their good days, but I was unaware of the intellectual prowess and wisdom of The Mighty Atheist™, dwarfing that of a mere theist. What I had yet to learn, however, is that they also have super powers that are even magical at times. Now I know better. Christians and creationists, I hope you heed this warning! 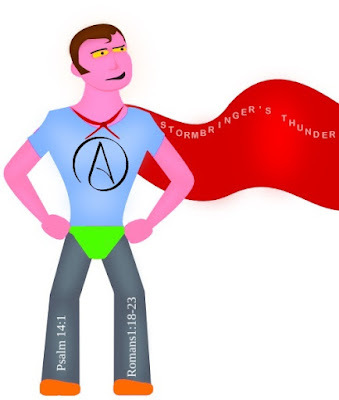 As with other super powers, those of The Mighty Atheist™ are difficult to categorize. Not all atheists and evolutionists have the same powers to the same degree, and there is no special school for gifted atheists under a professor so they can develop their abilities. Like logical fallacies, powers often blend and overlap. Let's saddle up and ride over yonder to Deception Pass where the atheists, atheopaths, anti-creationists, and others are having a hootenanny to celebrate International Atheists Day right now. Yes, they know what you are going to say one-on-one, what a creationist is going to say at a conference, and everything between. Many often know what you are doing during your Sisyphean apologetic efforts. They also know that difficulties for evolution discussed by creationists (such as dinosaur blood and soft tissues) will someday have a scientific explanation, so creationists are already wrong before that great day happens. An example: "I could ask Gordons WHAT 'misrepresentation' took place and WHAT relevant information I omitted. But he would not answer my question. So I don't think I'll bother." Atheists are able to read an introduction to an article or even just a title and know what is being said. There is no need to follow links or read the rest of the article. This tinhorn is able to asses the intellectual ability of a writer and utterly dismiss him simply by reading a few paragraphs. Cherry-picking and straw man argumentation is permitted (discussed below). When challenging evolution and atheism, the Christians and creationists are required to provide credentials of advanced education in relevant areas. Since atheists and evolutionists have no need for reading articles and their supporting links, they are not required to show credentials — or even to possess significant education; any jasper can defend evolution. Flinging outdated, biased links from Wikipedia, Talk.Origins, (Ir)RationalWiki, and other sites that favor them is justified. Even an abstract (which is a kind of promise for what will be included in a scientific paper) is devastating to us. Indeed, the links to do not even need to be related to the topic at hand, and we are effectively refuted. A step further, although they disbelieve in God (but still hate him) and reject the Bible, many are experts in theology (albeit without education) and can refute any Christian who dares to oppose their statements. While the rest of us are constrained to following the rules of logic, The Mighty Atheist™ is able to use cherry-picking, misrepresentation, ad hominems, straw men, hasty generalization, and many more arguments that are normally considered illegitimate. When a Christian or creationist identifies those, fallacies are no longer fallacies, but are transformed into legitimate argumentation. In addition, actively lying about Christians and creationists is effective, because lies become truth when uttered by those with super powers. In a similar manner, opinions change into facts! Any assertion or accusation can be made, and evidence is unnecessary. Changing the subject and attacking when cornered is encouraged by these heroes of atheism, and again, no longer fallacious. Be afraid. Be very afraid. Atheists have conveniently redefined atheism as "lack of belief" instead of the long-established meaning of "belief that there is no God or supernatural". It becomes valid for an evolutionist or atheist to call someone a liar when a statement is made that these sidewinders dislike or are unable to refute. Yes, it becomes a lie because they said so. Actual definitions of atoms-to-atheist evolution can be changed so they can be more evolution-friendly. Calling someone a "fascist", even though most do not know what that word means, makes someone a fascist. We cannot dispute this ability, and must accept it. The Mighty Atheist™ has no tolerance for those of us who dare mock their popes and high priests, such as Carl Satan Sagan, Charles Darwin, Clinton Richard Dawkins, and so on. Presuppositions held by materialistic atheists and evolutionists are true, and need not be supported through logic. When challenged, the empowered atheist may shoot you down with death rays from his eyes, usually accompanied with epithets of, "Liar! Fascist! You know nothing of science! What you said is not true! I'm smarter than you!" and so on. Although they reject God, they hate him; blasphemy is acceptable in their eyes, even daring to call God a liar. They can find like-minded people to join on their atheistic jihads. Think of piranhas. (This ability is used frequently among atheists and evolutionists who have less developed super powers.) I had said that one atheopath has a personal motto of "I'm telling! ", and that is common among them. They seek out their own kind to join in with attacks, but also tattle on Christians and creationists to entreat assistance from those who may have power and authority. These junior members are often ignored by their superiors. One of the best things I learned from a comic book was the line from Spider-Man, "With great power comes great responsibility". When it comes to The Mighty Atheist™ , something similar is true: with great egos come the illusion of great power. Though most try to deny it, atheism is a religion. They may think we are defeated, but we have truth in the Word of God. They may think they are bringing the world wisdom and reason, but they are fools (Psalm 14:1). Despite the protestations of professing atheists, they do know that God the Creator exists (Rom. 1:18-23). Their worldly "wisdom" is worthless (1 Cor. 1:20). Like the rest of us, they have sinned (Rom. 3:23) and deserve divine punishment, but can be redeemed (Rom. 6:23). Not only redeemed, but can become children of God (John 1:12, Rom. 8:13-17). The tremendous pride, arrogance, and bullying of atheists and fundamentalist evolutionists makes it difficult for them to humble themselves and repent, but they can have new life. Not just atheists, but all unbelievers are under God's wrath and need to repent for salvation. Today is April 1. Don't be a fool in God's eyes.